To catch a jump on the fake Red Dwarf DVD covers that always seem to appear on the net around this time of year, we present the development art for the covers of Series VII and VIII. The colours are approximately what you'll see at the final stage, with Series VII's GELF ship and VIII's prison tower as the basis for Chris Veale's work this time around. 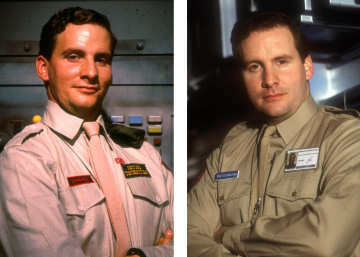 As usual, photo choices emphasise the Rimmer/Lister theme on the front cover, with the back given over to a small shot of either 'the entire crew' or 'a scene you might remember' respectively. The nanobots have populated the ship with its original crew. This is especially good news for Rimmer, who is now a lot less dead, but is extremely bad news for everyone else. Locked up on Red Dwarf's prison deck, the crew join the Canaries - a battle hardened convict army and not, as they first thought, the prison choir. But what's this? Series VII is described as 'Entire and Extended'! That's right, we're really pushing the boat out this time - you'll be able to watch either the original or 'Xtended' versions of Tikka to Ride, Ouroboros and Duct Soup. The Xtended editions include additional scenes and effects sequences, plus the peculiar experience of no laugh track. Nor does the joy end there. Series VIII is likely to include the full-length versions of Back in the Red and Pete. Doug was never entirely happy when these episodes had to be shown as multi-parters, and in their full-length edits make for a much more satisfying viewing experience. How will all this fit on the DVDs, I hear you ask? (If I strain hard enough.) Simple, in discussion with 2 Entertain/BBC DVD, we're aiming to put Series VII and VIII out on three discs each! And the way the edit's going, we'll need every inch of space. And you thought this was just a dull little piece about cover design. Shame on you. Still, now we have your attention, why not share your thoughts now on our Webboard. More DVD Details will follow soon.